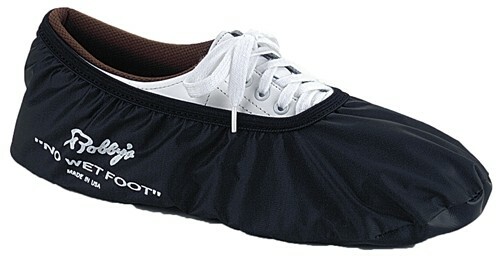 Protect your bowling shoes by slipping a pair of these bowling shoe covers on them when you're leaving the lane. They're made of high-quality vinyl with an elastic top to keep water, mud and dirt off your bowling shoes. I have been able to walk into the bathroom and not even worry about my bowling shoes getting wet even going outside is no problem. These covers are defianltly one of the best pair that I have bought. Do NOT get hooked into buying these on purchase! The stitching on elastic tore out of material the first time I tried to put on shoe. I would definitely ask for largest size available if you must have this cover by this manufacture. Otherwise, look for another brand with favorable reviews. They are very hard to get on and off. They tear very easy I used mine twice and they are already tearing. I received these on March 3 and they ripped at the seam on March 21. I have taken them off and put them on 4 times since purchase and they ripped at the seam of the heel. Very upset considering the cost. These were even 1 size bigger than recommended to prevent this kind of thing. My shoe size is 12. I wear these to go out the front door of my bowling center to smoke. The elastic rips. It's difficult to get on and off. The soles tear. I'm glad it comes as 2 so I can wear one until it tears and then start using the other. I won't purchase them again. Is it made of plastic materials?? They're made of high-quality vinyl with an elastic top to keep water, mud and dirt off your bowling shoes. These will have a soft vinyl. Will a large fit a size 11 women's shoe? The Large shows to fit a Ladies 12+ or Mens 8-9.5. The Medium shows to fit a women 11 but it is the largest size the medium would fit so you may like to go up so the cover will not be as hard to get on the shoes. Due to the time it takes to produce the Robbys No Wet Foot Black ball it will ship in immediately. We cannot ship this ball outside the United States.